Home Art Why Are All Those Rap Quotes Showing Up on L.A. Street Signs? Why Are All Those Rap Quotes Showing Up on L.A. Street Signs? It’s the typographical mayhem of artist Jay Shells. Sure, hip-hop originated from the streets. Now, its lyrics can been seen on them. After creating street signs featuring lyrics that represent different neighborhoods of New York City, artist Jay Shells has brought the concept to Los Angeles, showering West Coast rappers with some love. Shells’ signs have recently been spotted around the city, sporting lyrics that correspond with their location. One example features a red sign that reads: “Run it down the line, Sunset & Vine, blew a half a zip by the Hollywood sign – Snoop Dogg.” You can probably guess the locale. Shells’ typographical mayhem started with etiquette suggestions that he posted around the Big Apple, encouraging behavior tips like “Clean up after your horse” (posted in a busy intersection), “Pull Up Your Pants,” and “Pay Attention While Walking.” To post these signs, Shells donned an orange reflective vest, which offers institutional camouflage, making him look like a city worker. With his hidden-in-plain-sight garb, he was able to put up his signs in broad daylight. The Rap Quotes project provides less of a humorous diversion than the etiquette tips and instead creates a sense of history that interfaces with the urban environment. One of his Los Angeles signs reads: “Catch me on the block, Fairfax and Oakwood, rolling up sipping on the finest Alcohol – Hodgy Beats.” Another, quoting local rapper Murs, proclaims: “On 3rd & LA Cienega can’t front, I was into her, she offered me a blunt damn I wish I smoked indica.” Many of these signs, like the lyrics they quote, are devoted to capturing ephemeral moments: epic parties, encounters with girls. When Shells posts a lyric, it’s not just a funny phrase; it’s a snapshot of social interactions specific to local relationships. The signs also offer a new cartography of Los Angeles, one that charts an alternate urban history, one outside of official placards commemorating bygone battles and the homes of dead politician. The new history puts the stories of ordinary, African American youth on the same spectrum as famous historical figures. Like this sign posted in New York’s gritty yet gentrifying Bed Stuy neighborhood: “158 Lewis Avenue Between Lafayette and Van Buren, that was back durin’ the days of hangin’ on my Bed Stuy Block.” The lyrics from Big Daddy Kane’s “Stop Shammin” depict a leisurely vignette in the heart of the once dangerous area. It creates a different narrative for the region while acting as an archive of his time there. As neighborhoods evolve, Shells captures the lives those who came before. When posted in public, the lyrics become more tangible, pinning a song to a place. 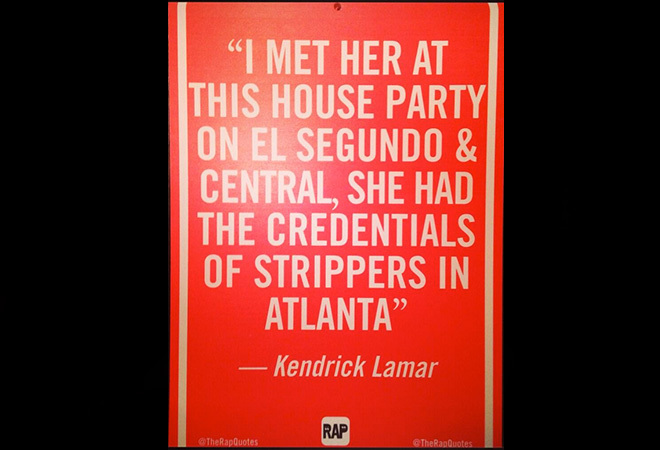 In South L.A., a sign showcasing Kendrick Lamar’s words, “I met her at this house party on El Segundo and Central, she had the credentials of strippers in Atlanta” changes that once anonymous intersection forever. Previous articleAsk Chris: Yo Quiero…Hickory Bell?